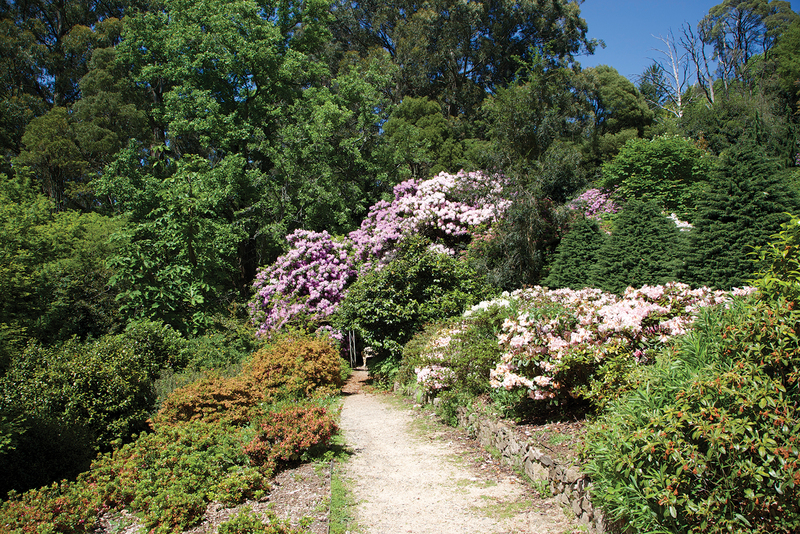 One of Olinda’s original properties combines rhododendrons and an azalea maze with an historic and beautiful cottage. Olinda’s Rangeview combines history, beauty, views and a lovely garden. With a cottage dating to 1917 (and many mature trees and shrubs to match) the place feels very special. 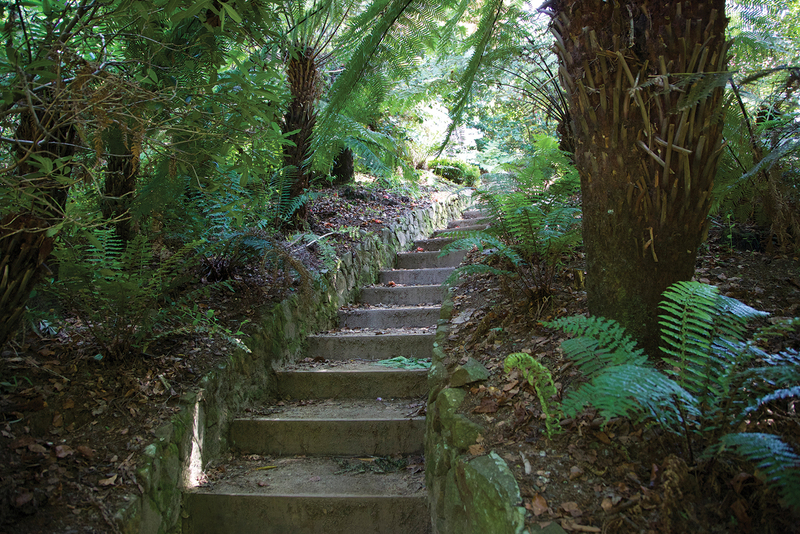 Set high in the Dandenong Ranges, Olinda is named for nearby Olinda Creek and is particularly lovely for its cool mountain forest, its lyrebirds, beautiful gardens, history and occasional snowfall in winter. It has long been a mecca for artists, including Sir Arthur Streeton. Surveyors initially called it Running Creek, but Olinda Creek was renamed either in honour of Alice Olinda Hodgkinson (the daughter of a prominent surveyor) or from a corruption of a Spanish word meaning “oh, most beautiful” by local vignerons; the truth is lost in the mists of time. However we do know that woodcutters worked in the area in the 1850s; that the first allotments of 100 acres were sold in the district in the early 1870s; then 10-acre parcels were sold in the mid-1890s. Delve further back to the indigenous Kulin people and it’s unsurprising that there’s a sacred place near Olinda. One man who bought a 10-acre parcel in 1895, a few kilometres south of the township, was George Woolrich, and to this day the road is called Woolrich Road. George cleared his land in an area then called Mernda (now Olinda). He was to marry and have two sons, Jim and Ted, later splitting his land, giving each half. Jim’s portion is closest to the main road and became a wholesale nursery; it is the site of the current Cloudehill nursery and garden. Next door, on his five acres, Ted Woolrich built a cottage in 1917 and in the same year he opened a retail nursery which he called Rangeview. It was to become one of the largest in the hills. Stories abound of the brothers and their wives; evidently they worked together and one legacy is that, to this day, trees and shrubs planted on both properties to be “stock plants” – plants you can take cuttings from – are now, nearly a century later, large, impressive and irreplaceable. Ted’s wife was particularly interesting. Born Iris Dorey, she was to open a cafe called the Quamby Cafe with her sister and mother in Olinda in 1914; it was located where the Cuckoo now stands. She married at 39. From serving cups of tea with scones and cream from their own cow, her life became oriented much more outdoors. On one occasion when a customer was trying to find Jim, he could only find Iris and Jim’s wife Bessy, in sou’westers, up a large tree, cutting foliage for the flower industry. 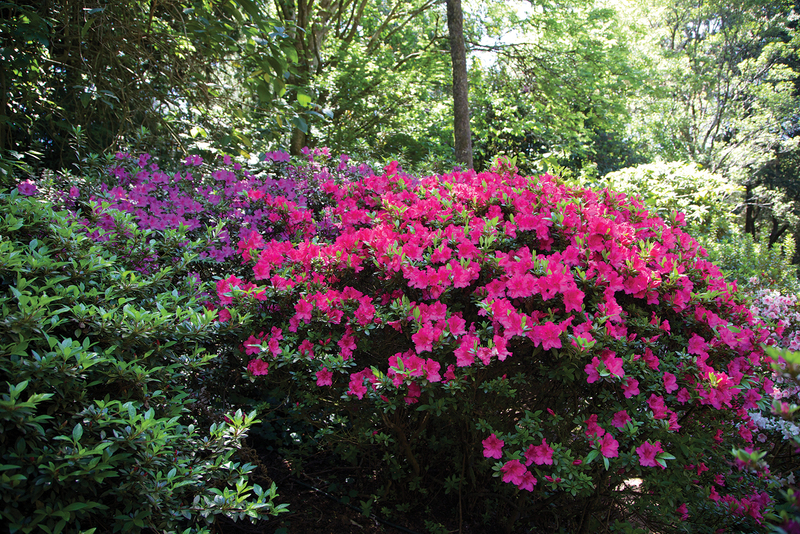 Ted exhibited in flower shows, loved rhododendrons, and was instrumental in establishing the nearby Rhododendron Gardens. 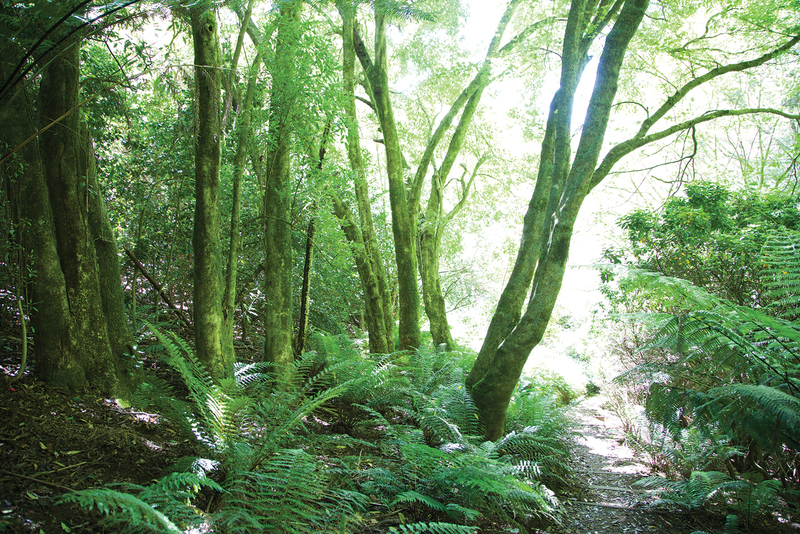 By the 1920s Rangeview was one of the most prominent nurseries in the Dandenong Ranges. We can only imagine the lovely garden that this interesting couple may have made; however much of the steep land was nursery and they were helped by nursery hands including many Dutch people after World War II. Bushfire, however, struck in 1962. Police were evacuating residents and, legend has it, Ted threatened the police with a pitchfork – he was adamant that he wanted to stay to protect his home. It was a fierce battle but the house was saved with the help of two friends. Sadly much of his stock was lost, but other nurserymen gave him replacements and Ted started again. But bushfire visited the hills again in 1968 and Ted lost stock again; this time he lost heart. Rangeview’s nursery days were over. Iris sold Rangeview in the 1970s and artists moved into the cottage. A house was built in 1987 and then in 2004 the current owners, Mary and Ches Mason, bought in and began to adapt the garden and the cottage. The cottage, Mary said, had no kitchen or bathroom; furthermore, it was painted bright red and blue within. She has certainly changed that, adding a bathroom under a lean-to and a comprehensive kitchen within the living room, steps away from stupendous views. It’s now a bed and breakfast named Woolrich Retreat. The garden has changed too. Despite those fires, some large trees remain: an American tulip tree; a 100-year-old crazy filbert; and a weeping beech imported from the UK in 1928. 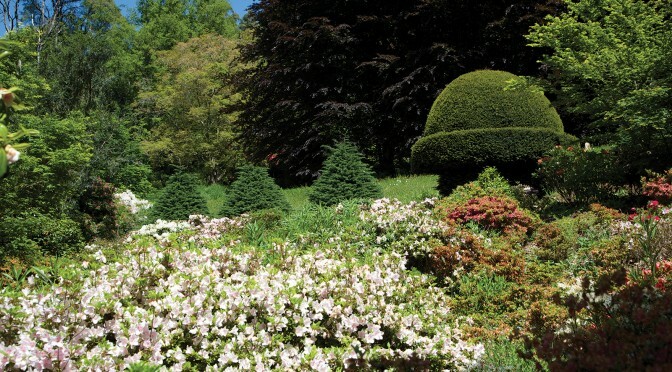 Gravel paths lead to an azalea maze planted in 1922. As records have been destroyed by fire, some oral history has been invaluable. 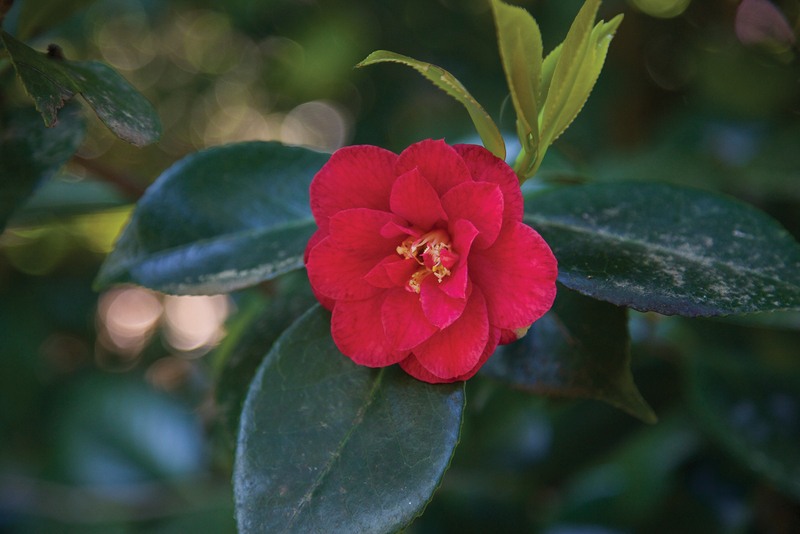 In early spring red camellias are joined by the first pink rhododendrons, and perfume wafts from daphne shrubs. A large bed of pure white winter roses is particularly lovely. Soon after, swathes of daffodils burst out, golden, under the beech. Stone wall-edged paths lead to a conifer walk. What is very endearing, though, is that Mary welcomes the lyrebirds. These beautiful birds have powerful claws that do real damage to a garden, but are found throughout Rangeview, like a lucky charm. Rangeview is unique; an historic property with significant plants, now owned by a gardener with a good eye for colour and placement; surrounding a notable cottage once owned by one of our leading horticultural figures, and a colourful one at that. When George Woolrich cleared his land in 1895, he was bequeathing to more people than just his two sons.